Whilst health and safety issues within construction and manufacturing are well covered, health and safety around the office is sometimes less commonly thought about. Beyond an occasional fire drill and maybe a, “Mind your back” when somebody moves the photocopier or a box of paper, it’s a secondary thought. Physical health and safety issues are probably easy to spot because they appear so infrequently. But there are also some unseen health and safety issues in the office. A recent BBC News story documented the story of the Frenchman, Frederic Desnard, who is suing his former employer over “bore out” because it turned him into a “professional zombie”, meaning it killed him professionally and therefore ruined his employability. It may be a lighthearted “And Finally” news item, but one which points to a wider message which employers need to be highly conscious of. And it isn’t something new. The deskilling of once complex jobs due to technological advances. Failure to gain promotion as those higher up don’t move on themselves or they are simply working longer and company structures tend to be flatter as a result, compared to earlier generations which offered more chance for promotion. Over qualification for the role is common as a by-product of the aforementioned lack of promotion opportunities and the more readily available access to Higher Education. Lack of empowerment in the workplace as businesses frequently become run by a small team of executive and senior management with a large team of underlings. Paperwork and email overload can also become a daily grind which wears employees down and causes stress. Repetitive or too frequent meetings leave employees feeling as though time is wasted and their days are becoming unproductive. This can lead to boredom in the workplace - which isn’t great for company productivity either, so both parties are suffering. From an employee point of view, at best, those Boredom and Fatigue causes can lead you to wanting to secure a new place of work. At worst, workers can be left frustrated and stagnated to the point of anxiety and stress about where their career - and therefore life - is heading. Failure to resolve this often leads to stress, anxiety and depression. Changing company structure to allow more promotions or higher wages is obviously an inappropriate suggestion - if we could all do that, we like to think we would. Instead, it’s more practical to talk about how mental wellbeing in the office can be improved by boosting morale, productivity and job satisfaction. Including commuting time, most of us spend well over 40 hours a week working; it makes sense to make it as enjoyable as possible for ourselves and our colleagues. Studies by the Department for Business, Innovation and Skills show that businesses with higher levels of employee engagement benefit from better productivity, profitability and stronger staff commitment. This is because they are happier at work. Offer staff flexible working hours and allow them to change their start/finish time. This can help them avoid the peak rush hour traffic and arrive to the office/home more refreshed and less stressed. It also shows that the business sees them as a person with feelings and considerations. Flexibility in workspaces and locations can help too. Letting staff hot-desk or rotating locations at regular intervals varies whom they spend their working day with can keep the office more engaged and sociable. A temporary change to roles and responsibilities can help a bored employee feel stretched and renewed, even injecting some of that lost drive and ambition as they sample life at a higher grade. This is common in the public sector and maternity leave is a great opportunity for management to blood and test less senior staff in a controlled timeframe. Change break and lunch times to vary the pace of the working day - something as simple as splitting up the lunch hour into three 20 minute breaks makes the day more manageable and stops any tasks feeling like they consume an employee’s day entirely. If staff have reached the point of suffering from stress, anxiety or depression, it’s important to engage with them and accommodate their needs. Make sure that there is adequate quiet space where they don’t have to face the world or what is causing them stress - even if it’s working in their manager’s office instead of surrounded by dozens of colleagues, it can really help someone who is struggling. Management should also be sure to offer increased support in terms of organisation of the working week and task management, to stop staff becoming overwhelmed. Even in 2016, there is still work to be done to make mental wellbeing an openly discussed issue around the workplace. As we look set for continued slow economic growth in most areas of the country, the chance of pay rises and promotions for all still feel a long way away. As people continue to be well trained and technology makes the working day easier, it’s going to become increasingly important to make sure that office staff don’t suffer from Rust - or what it eventually grows into if left unchecked. 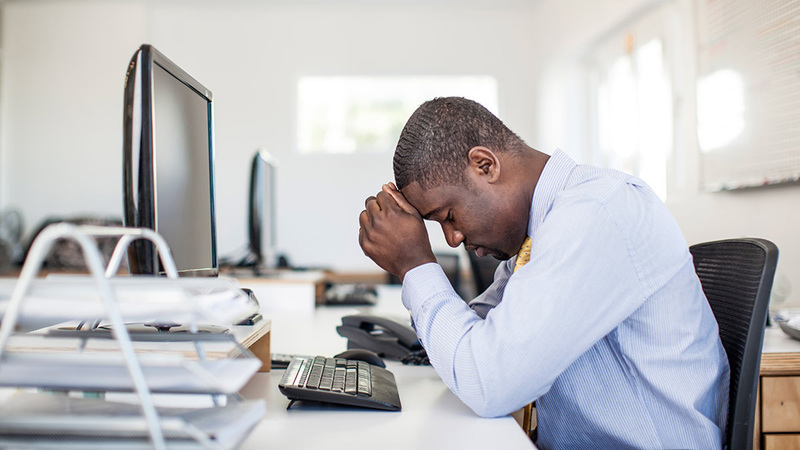 One way to protect against stress in the workplace is to make sure everyone is aware of the signs and control measures for stress. Our new IOSH approved course, Stress and workplace wellbeing covers all of this and more.